Composer – Can be used to configure AccountingIntegrator and Sentinel. Composer is also used to set up the Sentinel server and to import Tracked Objects for those products. For more information, see With Composer. Configuration operations for other products are performed in real-time because their user interfaces are connected directly to the runtime environment. In Composer, you can create and update a dynamic Axway product configuration. You then broadcast the configuration to an Axway server (the development environment) for testing and validation. After your configuration is validated in the development environment, you export your configuration to a container. This container holds all the dynamic runtime configuration information and an attributes.xml file that contains all the data specific to the environment such as the host name, IP port, URL to the database, and so on. The container can then be deployed to test the production environments. 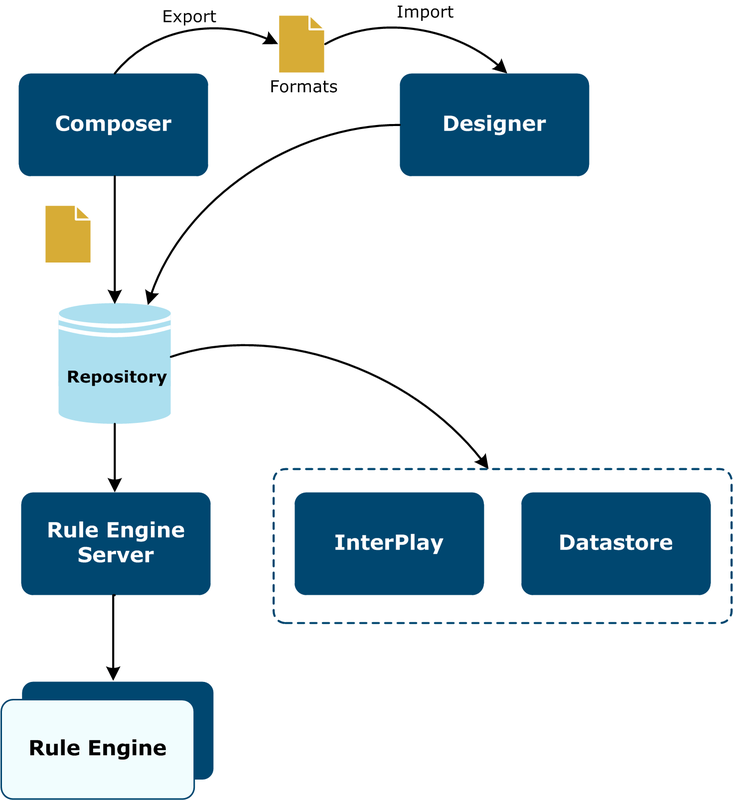 In Composer, the user develops formats and accounting rules, and then deploys the configuration to the repository that stores all the runtime configuration for AccountingIntegrator, Datastore, and InterPlay. External referential tables can also be imported to the repository and associated to a given configuration. 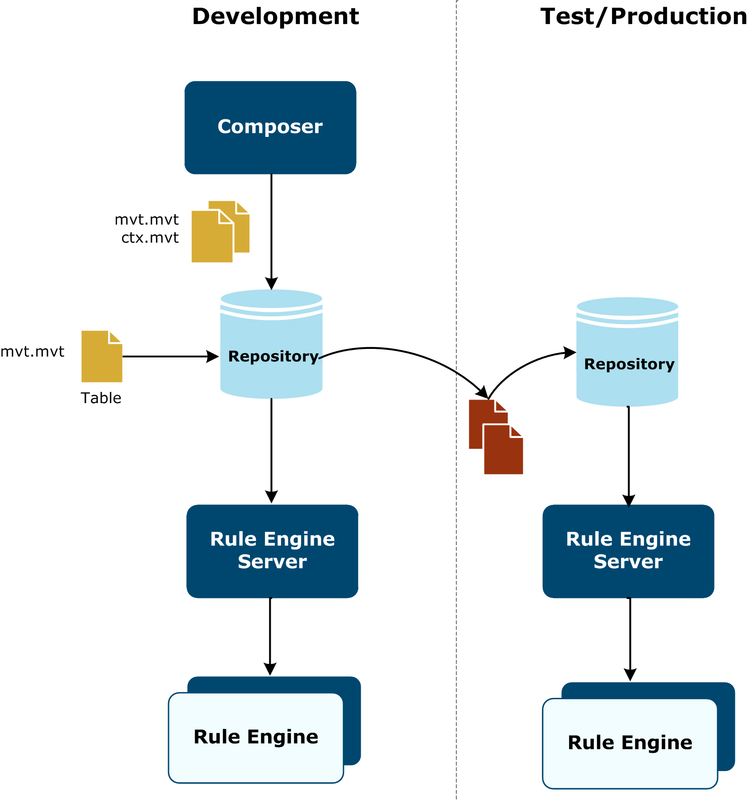 At execution time, when the Rule Engine Server receives a request to process an input file, it looks into the repository to find the needed configuration and uses it to setup a Rule Engine. The entire deployed configuration can be exported from the development repository, then imported to another repository in another environment. Designer is a Web tool used to configure InterPlay and Datastore. The formats of the data that are processed by the AccountingIntegrator Rule Engine, stored in Datastore, and modified in InterPlay, are previously configured in Composer and Designer. The following diagram illustrates the interaction between Composer and Designer, and the global usage of the configuration. In Composer, the user creates the formats of the file to process and the accounting rules to generate the accounting entries. The configuration is then published to the repository. The formats are exported from Composer and imported to Designer, where they can be completed to suit the need of InterPlay and Datastore. For InterPlay, additional constraints or helpers are added to the format fields, such as default value, possible values, minimum and maximum values, and so on. This information will be used to configure the forms InterPlay will generate. The forms will be used to create, enrich or correct data matching the formats. For Datastore, indexes and partitioning information are added to the formats to optimize the storage and querying of the data. From Designer, the configuration is published to the repository. The configuration that is published to the repository is deployed to the Rule Engine Server, InterPlay and Datastore.